What type of warranty do you give? Since the individual Speedliner® Dealer warranties all work, warranties may vary. Most dealers will spot repair rips and tears to your liner at no extra charge for as long as you own your vehicle. We offer 22 factory colors: black, charcoal gray, medium gray, dove gray, red, garnet red (metallic color), yellow, orange, indigo blue (metallic color), dark blue, medium blue, emerald green (metallic color), dark green, medium green, camouflage green, camouflage brown, petrol blue, white (with top coat #6), pink and purple. In addition to our 22 factory colors, we can also custom color match using automotive paint. Ask your dealer for details. How thick is the bedliner? Based on our fantastic strength, our recommended thickness is 90 mils or a little less that 1/8 of an inch; however, Speedliner® 1000 can be sprayed thicker for an additional charge. With Speedliner® all types of graphic creations are possible. 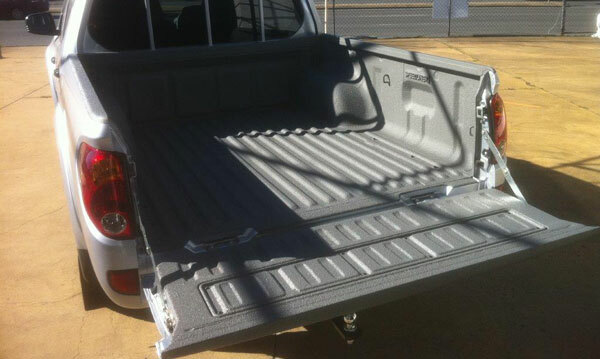 Visit our Truck Bedliners Applications Gallery to view our custom work. Ask you nearest dealer to confirm their graphics capability. How long does it take to spray? Depending on the dealer’s schedule, bedliners may be picked up same day or next morning. Weather conditions like cold temperatures and/or rain may also dictate that the truck stay at the dealer overnight to protect the new liner while in its early stages of curing. Our MSRP for bedliners range from $355-$550, depending on vehicle size and your choice of options. However, prices will vary from dealer to dealer. Can it be applied to wood, concrete, etc.? All Speedliner® products can be applied to many surfaces for many applications. Our rule of thumb tells us that if it can be painted, it can probably by coated with Speedliner®. Visit a dealer for more details. Speedliner® 1000 has great chemical resistance to many chemicals. Your local dealer will have a comprehensive list of tests showing how Speedliner®1000 performs against different chemicals. How long does it take to dry before using it? At 70 degrees you can carry light loads after 24 hours, and the bedliner is fully cured after 72 hours. Can I clean it with Armor All? Armor All will not hurt the liner; however, we don’t recommend using it. In the unlikely event you damage your liner and need a repair, a surface coated with Armor All is very difficult to adhere. Can you spray over the rails? Yes, all Speedliner® products can be sprayed over rails. Kevlar® brand fiber by DuPont™ is an additive used to enhance tear strength. It is recommended on heavy-duty trucks and high impact areas. *Kevlar® is a registered trademark of the EI Dupont Corporation.